In order to optimise production, procurement and to reduce the MOQs of items, many organisations have implemented group planning. Group planning also known as campaign planning is when the forecast for a grouping of products is combined to trigger a single larger MOQ. This could be grouped by a raw material, semi-finished goods or some other shared attribute. Other organisations have implemented cycle based scheduling. This is when a production rhythm is defined and planned production is pushed back or pulled forward into the appropriate planning bucket. This is to support with the sharing of MOQs and semi-finished batches, also to allow production to be optimised by manufacturing similar products together to reduce changeovers. Both of these are excellent initiatives help to increase FLOW by minimising the MOQ of a single item by producing it with items which share the same components or characteristics. The downside of these processes is that they are still driven by forecasting. What is not so clear to many is how DDMRP can still support and operate in this environment. This blog shares how DDMRP can be applied to group planning and cycle based scheduling by using a ‘virtual Min/Max’ buffer logic. 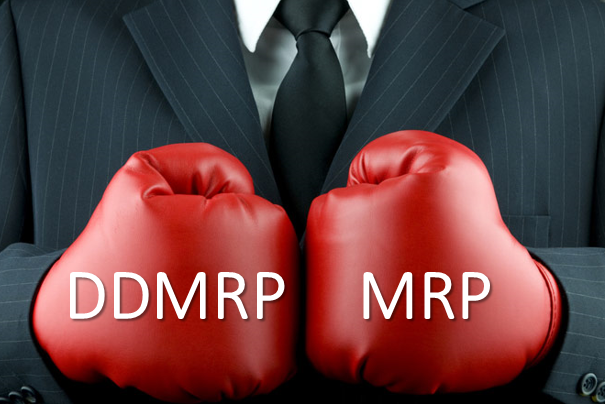 DDMRP vs MRP: Head to head, which wins? DDMRP as a methodology focusses on placing strategic buffers to enable lead time compression and by leveraging daily planning to react to daily sales orders. MRP has been commercialised since 1970 and has had minimal improvements since. DDMRP has its roots in Lean thinking and moves away from forecasting and having safety stocks to utilising buffers to absorb variability. This results in increased material availability as well as a reduction in working capital. This methodology has delivered phenomenal results in both service benefits and inventory reduction. Companies who have adopted DDMRP found that they are able to increase their service levels and sales with the same amount of inventory. All that they are doing differently is leveraging strategically placed buffers to decouple the supply chain to react to only real demand orders. When discussing Demand Driven MRP (DDMRP) one question often comes up. How much benefit of DDMRP is due to daily planning? This is driven by the understanding that reviewing your plan more frequently will enable you to make quick changes to demand. This is true. However, the difference between DDMRP and MRP remains that whilst MRP reacts to the changes of inaccurate forecasted demand, DDMRP reacts only to confirmed demand, not forecast. Material requirements planning (MRP) systems: 1950- conceived, 1960’s- codified, 1970’s- commercialised, 2015- minimal improvement since. On the other hand, the environment of supply chains today have changed drastically compared to those of the past. Customer lead-time tolerance has decreased, sourcing has become ever more global and supply lead-times are increasing. The accuracy of forecasting is static at best, though often worsening due to unstable markets driven by promotional activity and high portfolio complexity. Given the increased pressure for return on assets, inventory and investment, it is understandable why so many are seeking alternative planning solutions. Demand Driven Material Requirements Planning (DDMRP) is a methodology to decouple lead-times, delivering increased material availability whilst reducing working capital. It achieves this using strategically placed inventory buffers which then satisfy true demand without the input (and therefore error) of forecasts. The inventory buffers provide break points between each node of the supply chain, removing the conventional MRP dependancy on upstream lead-times.